Natasha and her business partner Kristy are co-owners of the Lucky Skates business and roller derby devotees, They love all things roller and inline skates. They have a physical store and a Shopify store and are doing many things the right way. This is an interview from The Cut podcast where we share insights into software and website development and Shopify ecommerce. This podcast is part of our series of interviews with Shopify merchants. The Cut has been working with the Shopify ecommerce platform since 2010 and we're official expert partners and Perth’s only Shopify Plus Partner. Our interviews with Shopify merchants are all about sharing ecommerce experience, insights, tips and tricks. You'll find these interviews helpful if you're thinking about Shopify looking to change your ecommerce platform or just wanting to hear more about Shopify from business owners just like you. Lucky Skates is a roller skate and inline skate specialist, we are based in Perth, WA and we sell roller skates, inline skates and all of the gear that's associated with that. We love to roller skate, so our vision is to get everyone skating. In this podcast, we're going to be speaking with Natasha from Lucky Skates. Lucky Skates have a bricks and mortar store right here in Perth, and of course a Shopify ecommerce store. They sell roller skates and inline skates and all the accessories and bits and bobs that go around roller skates and these guys are very passionate about skating and roller derby. So let's speak to Natasha and see what ecommerce insights she can share with us. Hello Natasha, thank you so much for joining us today. Hi Ben. Yep. No worries. Thank you very much. It's going to be cool to talk to you about the Lucky Skates business and I know you're in partnership with another roller derby aficionado, Kristy. So we'll get things kicked off. Can you introduce yourself and tell us about your business and your ecommerce story. Yeah, no worries. So, my name is Natasha Thorston and I’m otherwise known as ‘Minnie’. So that's my roller derby name and what I'm called by most people and I am the co owner of Lucky Skates. 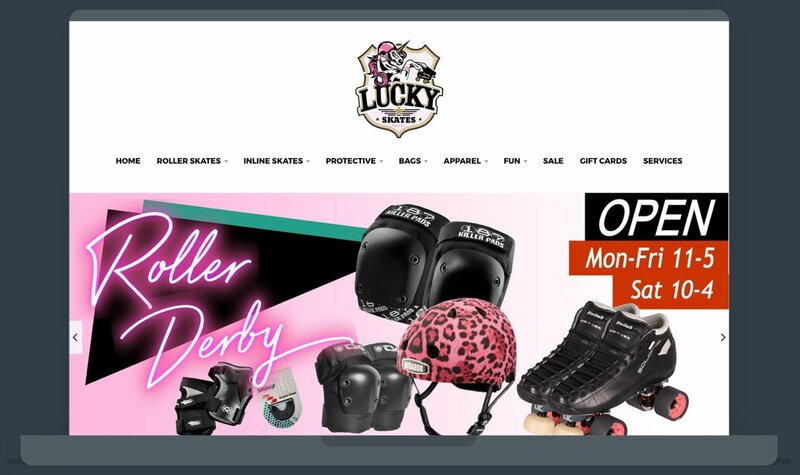 Lucky Skates is a roller skate and inline skate specialist, we are based in Perth, WA and we sell roller skates, inline skates and all of the gear that's associated with that. We love to roller skate, so our vision is to get everyone skating. That's awesome. And how long have you had your business? We started the business in February 2013. So we're now five and a half ish years in. We started as both, however, our website launch approximately two months after we opened the store. Okay. So that's pretty much the same time and pretty quick. So tell us a little bit about the beginning of your business and taking that first leap into running and owning your own business. What was that like for you guys? Yeah, no worries, it’s myself and my business partner Kristy who run the store, and we're in the store pretty much every day. Both of us have a roller derby background. so when we started roller derby in Perth 10 years ago, there was nowhere for us to go to get our gear. There was no dedicated roller skate shops in WA. And so everything that we had to order, we had to get online from the US, which had mixed results in terms of sizing and getting the right products. Can you give us an idea of the scale? I spoke to you about this at our event, but how many teams are running Roller Derby teams in Perth? Like right now, there are probably five leagues in Perth. Let me just do my math on that. There's two, three women's leagues and one men's league. And then there’s also leagues outside of Perth so Bunbury Albany, Geraldton and Port Headland and Kalgoorlie. There's quite a few around the place. And so how many people are we talking about in Perth that are into this? Well, it's hard to say because at one time you might have between, let's say a 40 to a hundred people in a league depending on the size. but that's not our only market. When we started that with definitely the market that we were targeting. But what we found is that there were more than just roller derby people who want to skate and we had a lot of people coming to us and asking us to help them basically. And that was children who aren't skating, people who want to just get at the skate park. Tt turned into people who wanted to skate on inline skates and then eventually to street hockey. So there's a big movement. Derby was your passion and inspiration in the beginning, but it's become diversified and there's obviously a lot more people skating who might not necessarily be roller derby guys. Absolutely. So yeah, it was born out of a need for us, for a local store where we could get everything we wanted and the right advice about it. But it has definitely grown into this bigger thing which is more about rollerskating and inline skating in general across not just Perth but even wider. We wanted what we wanted. We wanted to integrate our point of sale with our website. We wanted something that was easy to use and learn because we are not designers or coders. We are not web experts, we just learnt how to do Shopify. So let's have a quick chat specifically about Shopify. Did you start with the Shopify platform? We didn't. So we have been on a little bit of a rollercoaster with different platforms. That's a very common story, isn't it? Yeah. So we found Shopify, we've been on it now for one year. I think we just had our one year anniversary in September. Okay. So you're using alternate platforms for a good good few years then, around four or so years? Yeah. So we had in the past we had tried being hosted by like a private person who was hosting and designing and then we also tried a different ecommerce site, but both times there were things that were lacking and things that we wanted to be able to improve or do ourselves. That's how we kinda came across the Shopify platform. So did you actually find it and then choose it? Well we were in a pretty unique situation in that way, but unhappy with the previous ecommerce site and we knew that we needed to get out and find a new one. So we had criteria that helped us choose. And I think that was probably born out of knowing what we didn't want from having those experiences of not being able to update something, not getting support and not having the flexibility to do what we wanted to do. So we wanted to have the things that we wanted, we wanted to integrate our point of sale with our website. We wanted something that was easy to use and learn because we, as you know Ben, we are not designers or coders. We are not web experts, we just learnt how to do Shopify. And so we're definitely DIY. We wanted something that was template driven that would be simple for us to put together and simple for us to edit and we needed something that provided good and consistent support. So basically a brand that had a good name. And so we compared a few platforms but chose Shopify because it could meet all of those criteria. Yeah, that makes absolute sense. There are a lot of common stories that are shared between merchants and whether or not they do a lot of research and start with Shopify or they work with another platform and then find it lets them down and then they move to Shopify. Those sorts of variations on the Shopify story are really common in the community. So once you found Shopify and then, I mean obviously you guys had a point of comparison because you were a long time with another platform. But what was it like as the first stages of setting up your Shopify website. What was that like for you guys? Well, it was a long process for us because we spend a lot of time choosing which theme we wanted to use, but then we also had more than a thousand products that we needed to create. Obviously that includes the photos and the copy that we needed to create. Some of it we already had on our old platform, but some of it we needed to redo or update. And so that process itself took us about six months and that was something that we were doing in between sort of having this dying website, having this new website and working full time in the store. So it was a little bit stressful, but in the long term like it's been super useful. It surprised us. I'm glad we went through that because it gave us an opportunity to update things that needed to be updated. Actually, it's a funny question because I've installed the Shopify app on my phone and I didn't realise because I didn't have a look through that it would make a noise, the ‘Cha-Ching’ noise. So that noise actually went off in the middle of the night and it woke me up and I was woke up in a panic and I was like, what’s that noise? Why is there noise in my bedroom? And then I realised that it was for a sale, so I guess it was stressful at first, then after that it was replaced by happiness. So roller people aren’t averse to a bit of late night online shopping then? That's brilliant. And a very unique and entertaining first sale story too. Thank you for sharing. So let's talk about some of the ecommerce challenges that you've had and in general with Shopify, one of the biggest challenges you've experienced running an ecommerce business. I guess the number one thing for us which is relevant to this conversation was just finding that Point Of Sale and ecommerce platform that we could easily update. And that worked for us. So it needed to be something that was super DIY, like I said before, but apart from that, a big task for our business is sourcing high quality products. So we are really big believers in offering products that we would use ourselves and that isn't always what's easy to get. Sometimes you have to do a bit of digging. I guess postage. I think everybody grapples with postage because of the high cost in Australia, both in buying goods and also sending them out. Yeah. And that was a big conversation point at our last meetup which you were at. There was a lot of talk about a product delivery and fulfilment etcetera. It's a big talking point isn't it? Yeah, absolutely and I guess the industry that we're in is a competitive industry and so you need to love what you do. You need to be good at what you do and you need to believe in yourself. And I think if you have that, then you can potentially succeed. I think that's what's helped us succeed. Sure, sure. And how did you approach and solve those challenges? Obviously your first and biggest one was solved by finding Shopify, but around the other things like postage. What are the ongoing challenges, those things that you've been able to resolve? Yeah, I think there are ongoing challenges, but for every single one of those points, a lot of it is about being adaptable and open to change if necessary. So don't just keep doing the same thing over and over again because it's what you have done. Look for ways to improve in all areas, which includes postage and there's always, like even in the last month, we've been reassessing our postage and looking for new opportunities there. So I think that's important and I guess a lot of it is research, it's trial and error, it's owning any mistakes that you make and constantly reassessing what you do and how you do it to make sure that you are successful in your business. That sounds like a very mature approach to take. And I think as we commented on the night, even though you guys did it DIY and you profess to not having particular skills, you've produced a really nice looking site and brand, and a really authentic kind of tone of voice and presentation of your brand, which is awesome to see. So let's see if you can share some insights and advice with the people who might be listening to our podcast. What are your favourite apps and plugins? The most valuable ones that you've used so far in your business? I feel like you're going to laugh at us for this because to be honest, we have only just started playing around with these. Okay. So we have tried Kit and we've tried Mailchimp and we're currently using a photo app for items that we have that are coming soon so people can still see the item before they can get it and then that helps drive them into the store or let them know when something will be coming in. And we're currently looking at the Instagram and Wishlist apps. No there's nothing laughable there. You've got to do things when you're ready for them, while it might be off to a slow start, it sounds like got a good handful there that you're considering and looking at. So the thing for us, we know that there's more that we can do and we're still learning. We totally accept that we're not experts in this yet, but for us to commit to an app we need something that works well, has a purpose and it's something unique that we can't do ourselves. So if we can do it ourselves, we will. But if we need the App then that's when we start looking at the ones that we've been looking at. Sure. And of those four you mentioned there, how do you anticipate that they're going to add value to your business? If you want to just talk about one or two of them that stand out for you? Oh yeah. I guess the Wishlist app that we’re looking at using. We know that people will start using that, especially for Christmas, so it helps them make a list of products that they potentially want somebody to buy for them, which helps that person not having to be a mind reader or asking me what I think they want. It helps the customer, I guess it helps them improve their experience online and actually takes your specific product and sends it to the person who would be buying the gift, does it? I believe so. I think it allows you by making a list, but online are the things that you want and then being like, here's my list. Instead of getting out your catalog and circling, you know the things that you want and leaving it in a place where someone can accidentally find it. I totally get that and I guess particularly for the youngest guys who do that. When you're dealing with their parents or whatever. That's going to be a really powerful tool. I think we both have a really good idea of what our brand is and what we represent. We wanted it to be light, bright, friendly, fun. And we have a lot of categories so we also needed to have a theme that could handle that. If you had three top insights that you share with other ecommerce business people, what would they be? Because I think the thing to remember with our podcast and the show before community in general is a lot of them are business people in their early, in their business journey, and it's really valuable to hear insights from, from their peers. So if you've got three insights, what would you share with someone who might be starting out or at a similar place to you to you guys at the moment? Yeah, absolutely. I feel like we can definitely speak to that. So for us, creating a consistent look and feel with images and copy so that you're building trust in your brand. Choose a theme, if you're doing the Shopify thing, that suits your brand, sometimes that means choosing a theme, not necessarily from where Shopify has placed it. So for us, we didn't choose a sporting team, we chose a lifestyle theme because that suited us better. Can you outline your process around that? On what criteria were you choosing that theme? Because I think a lot of people probably choose themes based on the stock photography that looks very beautiful. So how did you guys look at that and what was the criteria that you were working to for your business? I think we both have a really good idea of what our brand is and what we represent. We wanted it to be light, bright, friendly, fun. And we have a lot of categories so we also needed to have a theme that could handle that. And when we looked at the sporting themes, we didn't necessarily find one that really spoke to us. It's a gut feeling. So it sounds like it's a bit of a combination between aesthetic and some particular functionality points in your case. But I guess it's about you guys are pretty clear on this understanding how you want your brand to look and feel and then looking for a theme that realises that feeling. Okay. So if you could give your young Shopify self some advice today, what would that be? I guess it’s about fun. It's an interesting one to me because I think we learned so much. I'm just being one year on Shpoify and we've learned so much in that year. One of the big ones is research the SEO stuff, so we didn't and we did have to revise some things on Shopify for example, like image names, what you would call something and how that can help boost you in the SEO world. There was a little bit of double handling when we had to go back and change it. So that's the actual names that you give your image files that you upload because Google sees those names. And there's lots of other things like that and they're tiny little changes. But if you get it right the first time, you won't have to go back though. For us, that was a big one. So your advice to your younger self would be title your images with a mind to their SEO value the first time around? Yes, absolutely. Don't discount the SEO stuff that's available to you on Shopify. So you're using the assets within Shopify that help you with your SEO performance? Yes. Well we have learned we have learned to do that, but we didn’t start that way. And the other thing that I would say is like, just do it like if your current ecommerce platform isn't delivering or isn't working or doesn't do what you want, then move on and do it now. Okay, well as Shopify expert partners, that is certainly a piece of advice we would endorse wholeheartedly here at The Cut, and I did not ask you to say that (laughs). I think one of the most important things is just having the clear navigation. If somebody can't find what they want then potentially they're going to go somewhere else. So just being clear in your navigation and then once they find the product that they are after, having the right photos. Great photos and then having informative copy. So let's move onto like converting traffic and I guess marketing. What sort of marketing do you guys invest in? I mean I guess we do all of the usual things. So we have our Google ads, we do Facebook and Instagram ads and we boost posts where we want to, but we also were on the ground as well a little bit more. So we distributed flyers and we also sponsor events and respond to skaters. And apart from that we've also run competitions in the past which has helped to boost our profile. So a really good combination of using technology and more traditional or grassroots marketing, and which are the most effective for you? I think it's a combination. Like definitely when we're talking about the ecommerce stuff, I know that the advertising, like the Google ads and the Facebook ads work. They are probably the two main drivers to our website, which Shopify tells us through the analytics. But in terms of getting people into the store, a lot of it is word of mouth. A lot of it is I'm just providing people with really good service and really friendly service and with the products that they want, but they can't get elsewhere. And that drives god will, they'll give us a good review on that or they'll talk about us in a really positive way and that will bring people in. Okay. And just out of interest, what sort of percentage of your business comes through your store, your bricks and mortar store as it compares to the online store. 100 percent, and you have and you have a very clear niche. I guess ultimately people want to come in and look around and pick up the skates and flick the wheels and watch them spin and all that sort of thing. How do you quantify it? I would say 80 percent is in store and 20 percent at the moment is online. And is your online component growing? Definitely, yes, it is definitely growing. Okay. when people land on your site, do you have any sort of key, deliberate strategies to retaining visitors and making it easy for them to find the products and convert to a sale ultimately? Yeah. I guess I can talk about how we try to convert our customers. I think one of the most important things is just having the clear navigation. If somebody can't find what they want then potentially they're going to go somewhere else. So just being clear in your navigation and then once they find the product that they are after, having the right photos. Great photos and then having informative copy. So for me, I just think about what I would want to see if I was buying it myself or put myself in the customer's shoes. And apart from that, would you have the consistent look and feel to the site? Like I've talked about before, we always stay current with pricing and what we offer. Staying current with the pricing and what we offer and being unique. I think when you get to our website it is unique. It does stand out from other businesses that have similar products. Yes, well I think what you're talking about in terms of how having helpful content that helps the potential customers to understand the products, the benefit of them, you're helping them make an informed decision within the environment of your website, aren't you. And I'm assuming you are, but are you using tools to measure the performance of your website? You've already mentioned as an aside that Shopify tells you which channels are driving the most traffic, so you're obviously using the Shopify metrics. We use those analytics as well as some Google Analytics to tell us who our main customers are and so that helps us to design different strategies for Facebook posts and Instagram posts and stuff like that. I don't think we have gone fully into what Shopify is capable of telling us yet, but it's definitely something that we're looking at and it handles a lot of the analytics stuff. Okay, and I think if you're looking at your metrics and making informed decisions and then tweaking things in your business, you're off on the right foot. And I think very few people, and even very few agencies, are using Google Analytics and even Shopify metrics to their full potential because they're incredibly sophisticated tools. Very powerful. But it sounds like you're off to a good start. Definitely. I mean, because I guess we're in a unique position that we are a bricks and mortar store, so the other way that we can measure the performance of our website, even just the layout of the website is face to face customer feedback because our customers are always clear about what they like and what they don't like when they visit us. And it gives us immediate feedback as to how we're laying things out. Sometimes it will change the way that I'll categorise something. Sometimes I'll create a new collection based on what they've told me. Good. So what is your process there? When people come in store, do you ask them for their impressions all of your website or do you just sort of wait for people to comment? Well, sometimes I will ask how they found us because if we don't know them, they're not a skater that we know and they're here because they've just found out about us and we'll ask them how they found us. And then they'll quite often just volunteer whether they like the website, what they're looking for on there if they couldn't find it. So I guess an example of that is recently I had a few people come in store and they wanted to know what kids clothing I had specifically like t shirts and socks and things like that. I could also track through Shopify because Shopify can tell you when someone searches for something and they don't find it. Shopify will tell you what they searched for being your top most searched for with no results. So kids clothing was coming up a little bit on that too. And I realised that maybe I needed to create a kid's tab under our clothing category, so I created that collection and then the next day I got sales from doing that. Wow, that’s an awesome example. That's brilliant. And as an aside, if you're doing that sort of thing, like taking feedback, looking at the metrics and then making informed decisions and then making small tweaks and changes that you can measure, well then you’re definitely doing it right. All right, well let's have a quick chat about the future before we wrap up this podcast with Lucky Skates. So what three things are on your Shopify wish list? Are there some things that you wished that you could do or would like to see Shopify offering, what would those things be for you guys? I think that the first one which we've talked about is more than 100 variants per product based on a few little searches of that in Shopify, the blog, there's a lot of people who are after that and I don't know if that will change anytime soon, but yeah, more than 100 variants per product class would be amazing. That would definitely exist in Shopify plus, wouldn't it? But then you guys aren't at the level where you'd be. You have to make a work around. Do you? Okay, well I've learned something from you on that. Are there any others? Yes, we would be really interested in any kind of Shopify workshops for like small business owners such as ourselves. As you know, face to face works best for us because of our limited technology experience. And the last thing would be the Shopify merchant facility. It's not currently available in Australia. I t would be cool if that is something that we could get. That's really good feedback and maybe those workshops are something that The Cut could look at in the future. We do offer one to ones around our Meetups to certain businesses and we do get them in to have a general discussion about their problems and challenges and give them advice and direction and they've worked quite well and people have really appreciated that sort of input. There's no reason we couldn't do them as group things either. So yeah, that's great feedback for us at The Cut. Thank you. What does the future look like for Lucky Skates, do you think? Like in the next 12 months or so? I mean I think that roller skating and inline skating is growing, especially in Perth and WA and you know, people are always keen to start a healthy lifestyle. So Roller Derby and straight road hockey are also growing markets. So for us, I mean the future looks pretty bright and I think that things can only kind of go up from here. That's awesome. And we certainly have the weather and I guess the flatness of our geography in Perth isn't a bad thing for you guys either. You're not dealing with trying to skate up and down crazy hills too often. No, we are really lucky actually. We have some of the best weather most of the time and we have beautiful places. We have the river that you can skate around. You've got the beach, there's just so many options. Anyway, where a bike can go, we can usually go. So yeah, there's just so many opportunities in Perth and it really is a good way to get around and just enjoy the city. And you guys have a clearly identified niche there to take advantage of that growth. So do you have any final thoughts for Shopify merchants or people who might be in a commerce, who might be considering Shopify or even just starting up their first online store. What would you say to them in a couple of quick sentences? Yeah, no worries. I mean, I would say do the research, make a plan, and then go for it. Perfect. That should be a headline in an ad. You've just written a very concise and perfect little snippet there. Thanks so much, Natasha. It's been awesome chatting for you. Thanks for joining us on the podcast and we really appreciate your input into our events and this interview today. You guys are to be congratulated. You're doing things really smart and it's great to see someone getting so much value out of the Shopify platform. So there you have it. Another one done. A really interesting chat with another real life, Shopify merchant, Natasha from Lucky Skates. We're doing these interviews all the time, so if you are a Shopify merchant and would like to be involved, just contact me or any of our team at The Cut and we'll organise your 15 minutes of fame. Thanks for joining us here at The Cut. Perth’s leading Shopify experts and only Shopify Plus Partner.